Pete Blohm was having a good season in 1989. He was 10-3 for single-A Augusta by early June. On this night, though, Blohm picked up a 3-1 loss to Spartanburg. "I did the same thing I've been doing all year," Blohm told The Spartanburg Herald-Journal afterward, "but I got a few pitches up high and they hit them." Blohm was in his third professional season that year. He ended up getting four more seasons, but he never had a chance to do that same thing in the majors. Blohm's professional career began in 1987, signed by the Braves as an undrafted free agent out of Johns Hopkins University. At Johns Hopkins, Blohm went 25-7 over his four years at the school, completing 22 games. He also had a career ERA of 2.85. In 2001, Blohm was inducted into the Johns Hopkins Athletic Hall of Fame. With the Braves, Blohm played at rookie Idaho Falls, going 4-3 in 14 outings, 10 starts. For 1988, Blohm moved to the Orioles system, playing at short-season Erie. For 1989, Blohm arrived with the Pirates, sent there to complete a trade. With the Pirates, Blohm started at Augusta and he started well. Overall, he went 13-4 there, with a 2.32 ERA. In late-June, Blohm spoke to The Pittsburgh Press about his hopes from his good start. "I'm hoping to make it to AA by the end of this year," he told The Press. Blohm didn't make AA. He did move to single-A Salem, and there he went 0-7, his ERA hitting 6.09. He didn't make AA until 1990, after moving to the Blue Jays system. 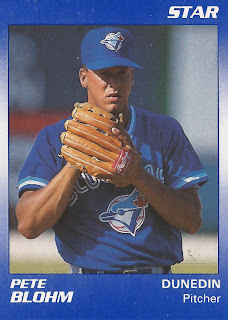 With the Blue Jays, he played 1990 at AA Knoxville. He got 30 outings there, 12 starts, posting a 4.50 ERA. By the end of 1990, Blohm was in AAA Syracuse, getting four relief outings there. He ended up staying at Syracuse through 1993, getting 30 or more outings each season. But Blohm never saw Toronto or the majors, his career ending after that 1993 season.